Place Hibiscus flowers in a pan with 6 cups of water. Bring to boil for a couple of minutes. Remove the pan from the heat and let it cool for 20 minutes. 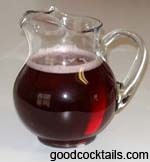 Strain the water into a pitcher and dilute it with 4 cups of cold water. Add sugar to taste.